Welcome to Terrinoth, adventurer! You are one of a few worthy heroes, wandering across the realm and taking what quests you encounter. But now, a dark terror from centuries past has awoken, and it threatens to cast all of Terrinoth into darkness. Only a peerless hero – a hero such as you – can defeat this evil and save the realm. Perhaps you will be the one to save Terrinoth and have your name enshrined as a living legend! 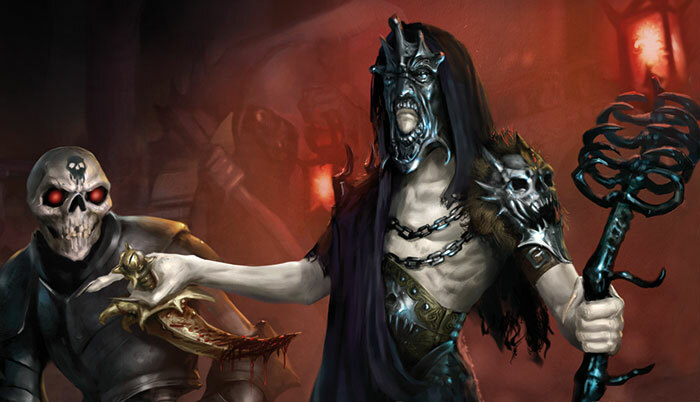 Players originally entered the fantasy realm of Terrinoth with the first edition of Runebound, more than ten years ago. Since then, we've invited you back to Terrinoth with games like Descent: Journeys in the Dark, BattleLore Second Edition, Rune Age, and Runewars. Now, you can return to the realm with a new version of Runebound, the game that first introduced you to Terrinoth! In Runebound, you take on up to three rivals in a contest to become the most renowned hero and save the realm. 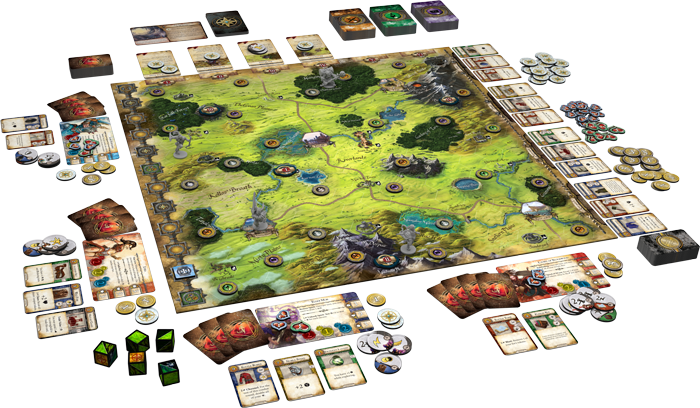 You and your rival heroes will adventure throughout Terrinoth, battling monsters, navigating tense social encounters, and exploring lost ruins and forgotten forests. As you adventure, your hero gains power, develops skills, and acquires powerful weapons, before using them to take on a deadly opponent in a climactic final battle. Only the mightiest hero will be remembered forever! In every game of Runebound, you craft your own story and play as one of six powerful heroes searching for adventure throughout the land of Terrinoth. The realm is filled with encounters for you to experience – adventures to join and quests to fulfill. You may battle a fearsome Ettin in the wilds of Terrinoth, take a smuggling job or report the smuggler, or take a quest to explore the heights of Madman Pass. The choices you make, like the adventures you choose, are ultimately yours, which gives Runebound a vast amount of replayability. Adventures are scattered across the map and represented by adventure gems. These adventure gems exist in three different colors, each of which corresponds to the type of adventure you may find: combat, social, or exploration. When you determine your hero’s story, you’re free to choose which adventures you wish to undertake. You may focus on combat, exploration, social encounters, or a mix of all three. Of course, to take on these adventures, you’ll need to brave the wilds of Terrinoth. 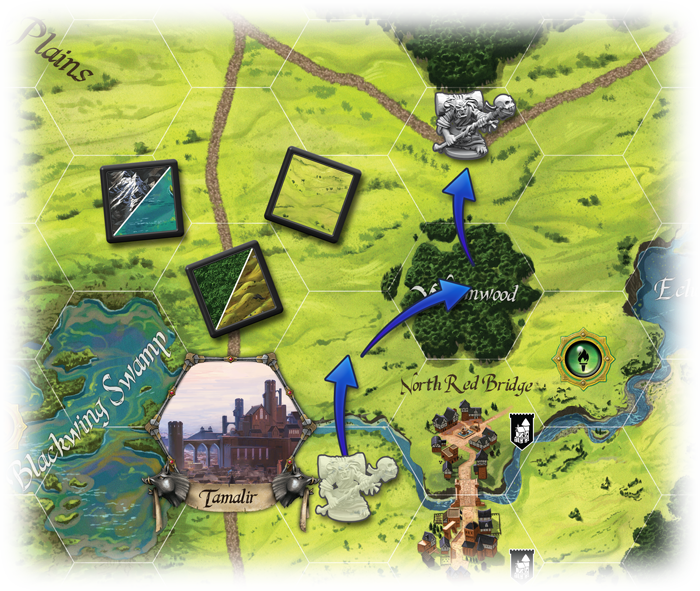 Movement in Runebound is governed by rolling terrain dice. You may move along the established roads quickly and easily, or you may cut across country, taking a potential shortcut that risks delay if the terrain dice don’t provide the results you need. Elder Mok rolls three terrain dice and uses the results to move across Terrinoth. Battles in Runebound are fast and tactical, using an innovative, token-based combat system. Each hero has a number of combat tokens, and when you engage in battle, you take all of your combat tokens in your hand and cast them like dice or flip them like coins. Once both you and your opponent have cast combat tokens, you take turns spending combat tokens to deal damage to your opponent, shield incoming attacks, flip your own or an opponent’s tokens, or stack your tokens to increase their power. 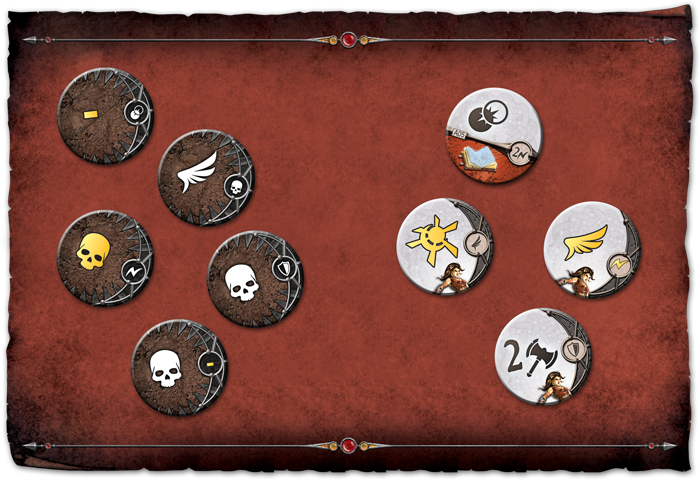 Players cast combat tokens and take turns spending them to engage in tense, tactical battles. Both heroes and enemies also have a number of surge abilities that you may trigger during battle with surges from your combat tokens. The possible effects are nearly limitless, and deciding which surge abilities to use and when is crucial to winning your battles in Terrinoth. We’ll discuss combat in much greater depth in a future preview ofRunebound. Adventures wait around every bend of the road in Terrinoth, but as your game of Runebound begins, a darkness from Terrinoth’s troubled past has returned to plague its future. Two unique scenarios offer vastly different threats for you to face in your games. You may face the dread inferno of Margath the Dragonlord, or you may contend with hordes of shambling undead as you battle Vorakesh, a powerful necromancer. In addition to the standard adventure cards, each scenario offers specific adventure cards to add to the adventure decks, making each scenario feel distinctly different and giving both scenarios great replayability. You’ll dive for cover from marauding dragons when you battle the ascendance of Margath, and you may explore Blackwing Swamp to search for a city of the dead that holds clues for defeating Vorakesh. In addition to these unique adventure cards, each scenario introduces a deck of story cards that drives the action and gives you additional quests to undertake. As you battle Margath, you’ll scour the realm for dragonlore in hopes of uncovering Margath’s weaknesses. When you take on the undead hordes of Vorakesh, you’ll slay his zombies wherever they appear and gather useful companions who can aid you in your adventure. No matter how many times you've played one of these scenarios, the huge number of adventures and quests makes these scenarios fresh every time you play. Slaying the minions of Vorakesh and Margath won’t do much good if you fail to defeat their master. Once you feel your character has gained enough power, you may travel to the heart of danger and confront the nemesis of Terrinoth in a fight to the death. In the two scenarios included in Runebound, the first player to defeat this nemesis wins the game, but if a hero fails to defeat this enemy, he is eliminated from the game. If you wish to defeat your foe and become a legend in Terrinoth, you must gain new skills and powerful items, but take care not to delay too long. If too much time passes before a hero defeats Margath or Vorakesh, all heroes lose the game! We’ll explore both of these scenarios in much more detail in a future Runebound preview. Of course, before your hero can defeat the likes of Margath or Vorakesh, he must grow from humble beginnings to become a peerless hero. You’ll need to learn new skills and acquire powerful items if you’re going to defeat your foes and become the savior of Terrinoth. To gain new skill cards, you use the trophies you obtain from completing adventures. These skill cards offer powerful new abilities ranging from increased speed to powerful spells. Every hero has three attributes: body, mind, and spirit. You may test these attributes during certain adventures, but they also determine how many skills your hero can hold. For example, if your hero has a body value of one, you may only have one body skill in play at a time. Skill cards have added benefits beyond granting enhanced abilities, though. You will frequently need to exert yourself in order to accomplish your goal, and exerting always requires you to discard a skill card from your hand. You may also improve your hero by purchasing new assets from the four Free Cities in this region of Terrinoth. When you travel into one of these cities, you have the option to purchase any of the assets sold in the city’s market stalls. You may pick up some goods and earn a profit by carrying them to their destination, whether a nearby stronghold or a remote shrine. Alternatively, you may gain new abilities and combat tokens by equipping new weapons, clothing, and equipment. In the course of your adventures, you’ll certainly want to put some of your gold to good use by visiting the marketplaces of Terrinoth. You'll be able to customize your hero differently in every game of Runebound, meaning that even if you play the same hero, every game can be different. Ancient evil threatens to plunge Terrinoth into a new era of darkness. Only you and a few other heroes have a chance of defeating this threat and saving the realm. Will you become a living legend, or will your name fade away with the other heroes who came too late? Decide your fate and the fate of Terrinoth in Runebound, and watch the video below for a brief video introduction to this new version of Runebound! 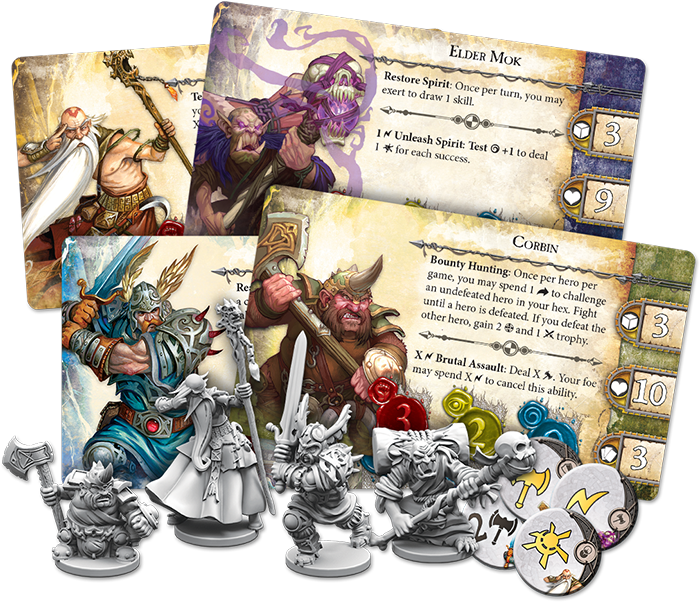 Look for Runebound at your local retailer in the fourth quarter of 2015.